The visuals in this film are going to be the best aspect of this movie. You can tell pretty early on that this movie was fully intended to be seen in 3D. I think that for a movie of this nature, two hours was about 30mins too long. It was just too far drawn out, and it's not like the story line was that deep either. While many of the 3D special effects were very entertaining to see, there some moments where it simply failed miserably. In the story, the “gods” are portrayed as being much bigger and taller than normal sized humans. For whatever reason, the special effects used to depict their size difference made the scene look of lesser quality. In many of the fighting sequences (i.e. when the gods fight a monster) a lot of computer effects were used. It looked cheap when you compare it to all of the other great 3D visuals during the movie. It would have been much better had they used more practical effects, or even just actors dressed up in costumes. One of the biggest criticisms this film received even before it was developed was for its lack of diverse casting. Many people felt as though having lead actors like Gerard Butler (a Scotsman) or Nikolaj Coster-Waldau (a Dutch actor) could hardly pass as Egyptians. It probably didn’t help much that the majority of brown to dark skinned actors were cast primarily as servants/slaves or ordinary people with less than significant roles. Although, it should be mentioned that Chadwick Boseman, who played the god of wisdom, was cast for whatever that’s worth. (His character was actually enjoyable.) Either way the casting is more than likely going to bother many other movie goers who are conscious and aware of the consistent lack of diverse representation in leading roles in Hollywood. Whether this is good or bad, I think it was a bit of a loss on Gerard Butler’s end as he really didn’t do anything different in this role as he did in 300. He was basically King Leonidas except with magical powers. 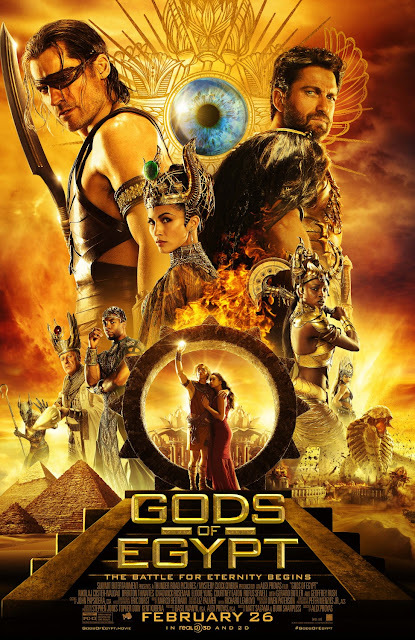 Gods of Egypt is like Clash of the Titans but set in Egypt. You may even think that you're watching a Michael Bay film given how the gods looked like Transformers and Power Rangers when they changed form. Here’s the deal with this movie; You’re either going to be offended by it and not watch it, go see it because all those listed “Bads” don’t matter to you, or you won’t see this at all. This is hardly the type of movie that will be remembered in the next couple of years, let alone a couple of weeks. It will come and go just like Exodus: Gods and Kings did, which also suffered from similar criticisms. Matter of fact, even a recast of this film wouldn’t really save it. Regardless of your views about this film, I don’t think it’s really necessary to go see. Honestly, if you don’t see it in theaters for the 3D aspect, then it’s more than definitely not worth watching at the end of the day. Save your money and time.